This is an amazing song and an amazing video. Korn returns to where they started and it shows in their music. I recommend this to any Korn fan. As I said, they are back! Korn Is Back After Three Long Years! It's been a long, hard, painful wait for all KoRn fans since Untitled. After these three years, KoRn is finally back with "Oildale (Leave Me Alone)". The song has that old school KoRn Kick, with a trippy vibe, included with elements they have learned in their 17 year career! People complain and complain about how the song doesn't sound like "Korn" and "Life Is Peachy", but that wasn't KoRn's goal. They wanted to make new work inspired by the vibe, recording methods, anger, emotion, etc. that there was on the first albums. This band never died! Every album to date has not been a let down. Each one has it's own unique element involved, and both KoRn fans and I know that this album won't be a let down. 2010 is the year of Korn, no doubt about it! I'm not a fanboy, I'm just very proud and happy with what this band has done, and I will never steer away from this band as long as I live! 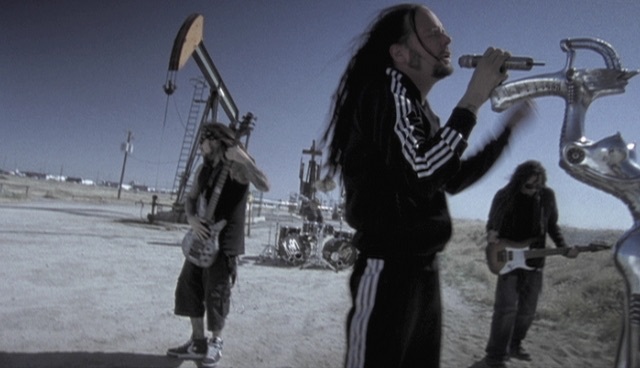 Oildale is the poster child for what is essentially Korn's rebirth. From its conception, the album Oildale is on (titled "Korn III: Remember Who You Are") was supposed to be Korn's return. After five years of experimentation with pop elements, Korn was going to return to mold. They were recording in an old-school fashion, and that was key. The music wasn't to sound like the older tunes, but it was to be about what those songs were about: The energy. And then Oildale came out, and we found out the aim succeeded in droves. The old school vibe was back, Korn was performing live the best they have in years, and many old-school fan-favorite elements were returning to the live shows (JD wearing his tracksuits, going shirtless, actually being passionate). The world is looking ripe for Korn's return, but the impact of the lead single will impact its success quite a bit. And likewise the impact of the music video will impact the impact of the song... So now we have Oildale, the music video. This video spells old school for Korn. First, the title is the name of the town where they grew up (or a suburb of that town, to be precise). Second, the video was actually shot in this location. Third, JD again dons his old ADIDAS tracksuit, which bodes so well for the future. As for the music video itself, it's about life in Oildale. It depicts the poverty and pitifulness of life there, despite all the riches they should have from big corporations using their land. The band performing is back to its old splender, as the past few videos have only showed a member at a time, this shows the band at all times. Further, every video from Korn's untitled album and most of the videos from their See You On the Other Side were intended as comedic videos. This is back to being a serious, down-to-business video with a point. So, all considered, the video itself is not bad, but not excellent. It's great, but falls short of perfection. But it's encouraging; Korn is looking to return, and to remember their roots, and it all begins here, and it's working. This video is their best in a while, and I highly recommend a purchase. It's filled to the brim with subliminal imagery and implications, and it's great, if you understand it. Buy it.